Almost everybody – from Shakespeare to Donald Trump - has an opinion about lawyers. Spectrem’s Professional Series looks at the facts about lawyers as it pertains to their lives as affluent investors. After years of studying professionals such as doctors, lawyers and accountants as one segment of the investor population, Spectrem has separated those different service-providing professionals and then compares investors from that one occupation to all other investors. The Professional Series study on lawyers finds that they are wealthy, knowledgeable and more likely to use a financial advisor than other investors. First, the good news: 85 percent of lawyers use a professional advisor, which is a very high percentage among occupations (by comparison, less than 80 percent of Educators use advisors, and the average of all investors is even lower, according to Spectrem research). Among the lawyers who do not use advisors, 70 percent believe they could do a better job of investing than the professionals in the field. More good news for advisors is that, according to the Spectrem research, attorneys on average consult with financial advisors on a greater portion of their assets than do other investors. All of this makes sense from an occupational standpoint. Lawyers are regularly consulted by clients to deal with issues of law that are over the heads of non-lawyers. In the same way, financial advisors are asked by clients to deal with issues of finances that are over the head of non-financiers. When attorneys are looking for financial and investment assistance, they understand the advantage of using a professional in that field. Now, some bad news for advisors as it relates to attorneys: lawyers are slightly more likely than other investors to think advisor fees are too high, and are more likely to believe advisors are motivated to sell certain products for their own benefit than for the benefit of clients. Again, this research makes sense. Considering the events which attorneys can sometimes deal with, it is not surprising that they might make for a suspicious client when it comes to advisor fees. The idea that lawyers would have some form of kinship with financial advisors takes a bit of a hit when it comes to referrals. No businessperson would turn down a referral for more business, and that is certainly true of both attorneys and advisors. But attorneys are less likely than other investors to refer their advisors to others, even though lawyers are more likely to have found their own advisor through a referral from a business associate than investors from other occupations. For what it’s worth, attorneys are more likely than other investors to use Full Service Brokers or Independent Financial Advisors as their primary advisor. Much of Spectrem’s research allows advisors to get to know their clients from a particular perspective – gender, age, wealth level, or occupation. But when it comes lawyers, advisors may already know something about them, since they provide similar services, that being giving advice. The similarity between services might make it easier to deal with and satisfy the needs of attorneys as investor clients. An additional benefit is that attorneys sometimes serve as a key relationship for advisors because attorneys will sometimes have an issue with their own client that requires financial or investment advice. 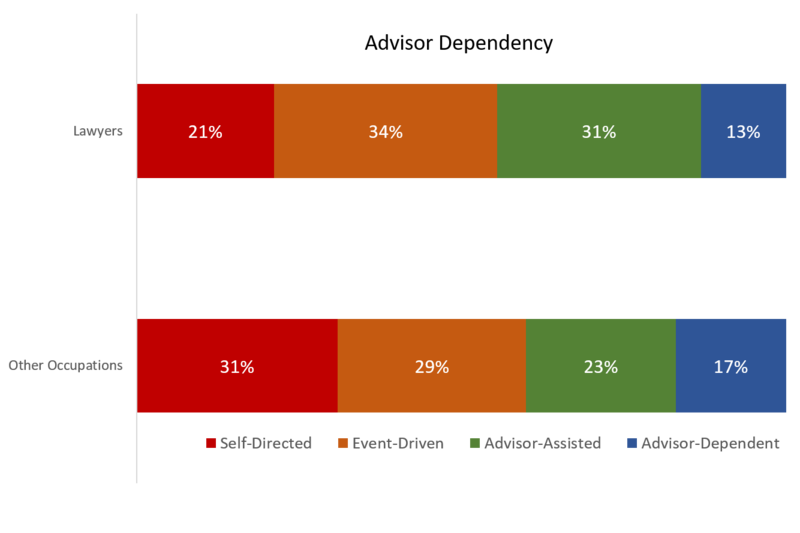 Spectrem’s study Centers of Influence tells exactly how that relationship works to the benefit of advisors.